Don’t building your marketing plan on reactive scenarios. Take control of your message. I recently had a client come to me who was very excited about a marketing opportunity. They’d published a piece on LinkedIn which had gotten some traction, and they wanted to know how to make the best use of the attention. I worked with them on the piece, helped to optimize it, and published it to Twitter, but at a certain point, there wasn’t much more that I could do. That’s because, while their article was great content, they hadn’t laid down the proper groundwork. This is a common misunderstanding among clients who are unfamiliar with the purpose behind content marketing. Their intent is good, but they don’t know what they don’t know. I laud their efforts, but without the right content strategy in place, they’re more likely to waste a lot of effort without seeing the results they need. Or, if they do get results, they won’t be prepared to handle them. So, how do you create a content marketing strategy that can set you up for success? Start with your website. Your website must have a purpose. When visitors come to your website, what do you want them to do? If your website doesn’t have a purpose, then… why does it exist? By “purpose,” we mean a number of things. Maybe you’re running an educational site, so your goal is to encourage visitors to read and share you content. Maybe you’re a non-profit, and you want to encourage donations or volunteering. As a membership organization, you might encourage visitors to join your community, or as an e-commerce business you could be guiding them toward adding items to their shopping cart. But whatever your goal is, you should design your site toward achieving its purpose. Now that we’ve established the whole reason you have a website to begin with, how do you get visitors to come see it? That’s where your content marketing strategy comes into play. Your content marketing strategy should focus on your website, not a content distribution platform. The content on your website should encourage visitors to stay around. It should alleviate any buyer hesitations they might have. It should educate them so that they know how to make a good purchasing decision. Most importantly, it should inspire them toward greater things. Maybe they can see how your product can make their lives easier, or how your non-profit can benefit their community, or how your service can improve their business. The important thing is that the content is on your blog, drawing visitors to your website, and improving your SEO. One big mistake that many businesses make is publishing content to places like LinkedIn or Medium rather than their own website. After all, why go through all the work of building your own audience when you could leverage the audience of these other channels that already have the brand recognition? Yes, it takes more of an effort to get your website in good order and to create an attractive blog page. But content distribution channels like LinkedIn and Medium should only ever supplement your blogging strategy, not replace it. After all, these platforms have a big audience, but you still have to compete for attention with everyone else on the platform. And it’s in the interest of these platforms to keep traffic on their website rather than to channel it to yours. The best way to manage this strategy is to build your own blogging base, and then incorporate a posting strategy to these other platforms that can lead visitors to your site. That way, should one of your posts take off, the publicity it attracts has a purpose. Content marketing is not about instant gratification. That said, it would be a mistake to create a content marketing strategy assuming that one of your posts will go viral. Internet attention is fickle. Your fifteen minutes of fame may never come, and even if they do, it may be for the wrong reasons. 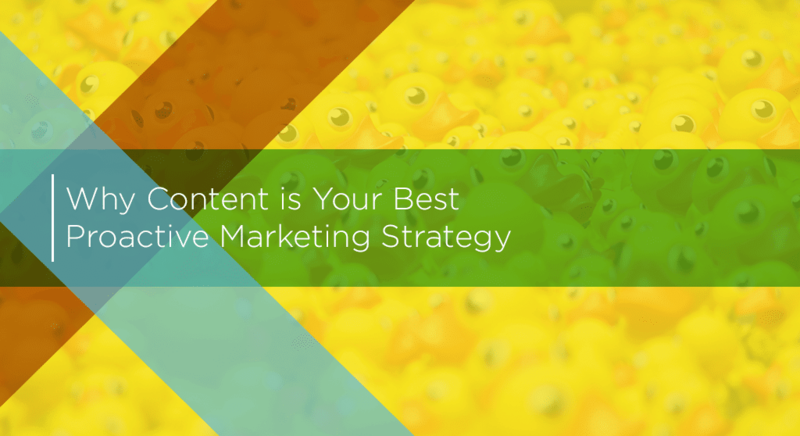 So with content marketing, if you’re not in it for the long haul, you’re playing the wrong game. It may not sound as exciting, but a long-term strategy is a far more stable investment for your business than a gamble. Advertising campaigns come and go, and once you stop pumping money into them your marketing is dead in the water. Content marketing lasts. Not only does that content stay with you, ready to be repackaged and sent out into the world a second time, but it also builds your domain authority, which will impact your organic search rankings and bring in traffic without a continual investment. The point is, if you don’t think about your marketing until you’re already in the hole, it’s going to take a lot of work to dig you out. Content marketing isn’t a silver bullet that can instantly pull your business out of the red. (Neither is SEO.) It is the insurance policy that can keep your business from falling into the red in the first place. If you’re not using a proactive marketing strategy, you’re putting the cart before the horse. Look back at the strategy we just laid out: First you design a website that will help you achieve your goal. Then you create blogs, videos, infographics, and other downloadable content to attract visitors to your site. Finally, you distribute your content on other channels to broaden your marketing reach. People encounter your marketing, land on your site, stay on your site because of all the great content you’ve produced, and eventually become brand converts. Sounds like a well-oiled machine, right? Now let’s return to our earlier scenario. You publish a think piece on LinkedIn. People read your article, but have nowhere to go. If you don’t like to your website, they won’t have any expose to your brand outside of whatever they see on LinkedIn. If they do wind up on your site, but find little to engage their attention, they’ll leave. And if your site doesn’t have a purpose to direct them toward, they won’t know what to do. And of course, if you get through all that and decide you need a helping hand, give us a shout! We want nothing more than to help you build a successful content marketing strategy for your business.